Lately I’ve been quilting most of my quilts, especially the smaller ones, with straight line quilting. I love random straight line quilting, like on this quilt, and I’m also quite fond of diagonal quilting, especially with double or triple quilting lines for a little something extra. I’ve wanted to try something new though, so I was happy when I thought of this little variation (inspired in part by the quilting on this mini quilt by Kate). I love how these quilting lines intersect in the middle to form one large diamond, along with several little diamonds along the midpoint. So here’s my pretend quilt. 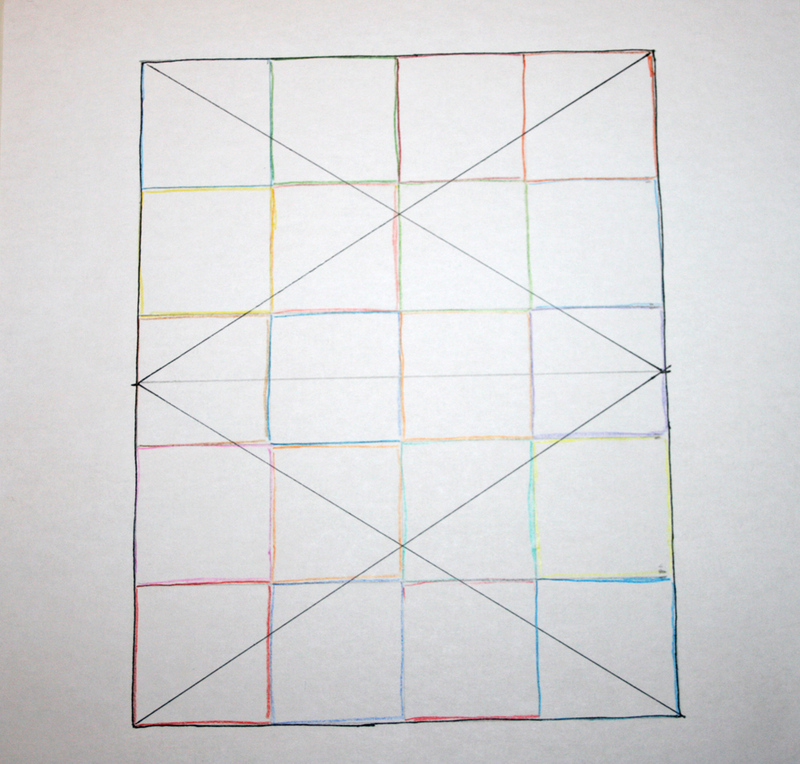 To start, measure along the long sides of your quilt and use a washable marker to mark the centerpoint of each long side (note: make sure you’ve squared up your quilt so the long sides are equal in length – otherwise this design won’t work out so well). 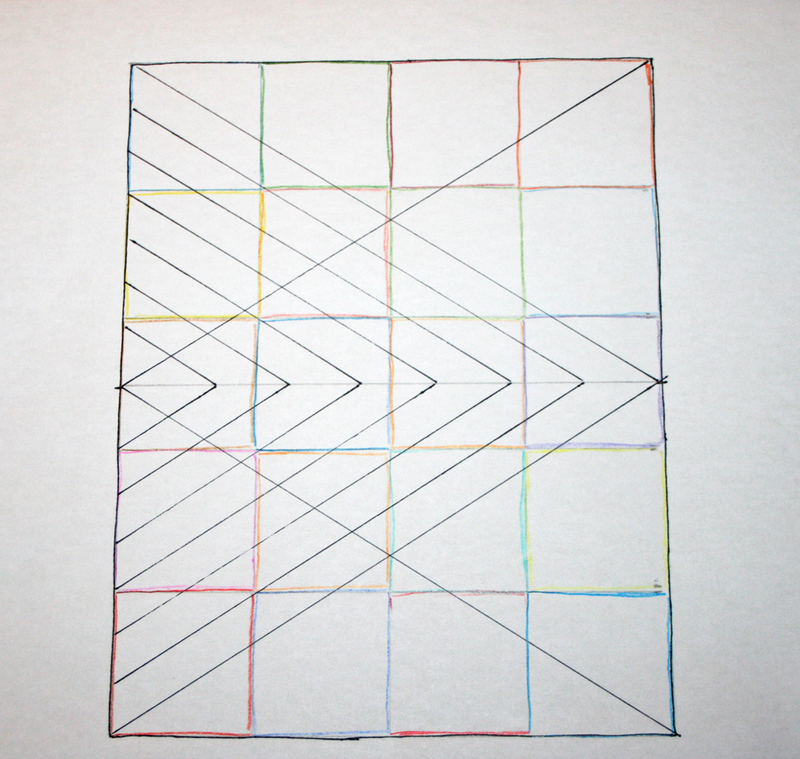 Draw a line across the middle of the quilt, connecting the two points. 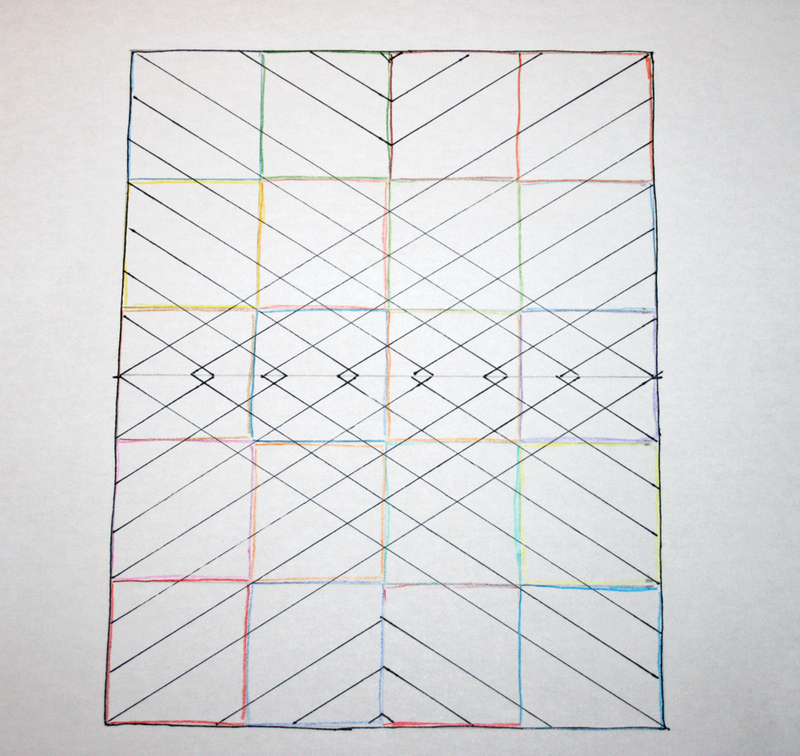 Starting from one upper corner, draw a diagonal line from the upper corner to the opposite centerpoint marking. Repeat for each corner, and you should end up with marked lines that look like the ones above. Stitch along one of your marked lines, creating a sideways ‘V’. Now decide how far apart you’d like your quilting lines. If you have an edge guide for your machine, set the guide at your desired distance. (For the manly baby quilt, I used a distance of 1 1/4″, but this is really up to you.) Use the guide to follow your first stitch line, keeping the needle down when you reach the marked horizontal centerpoint line you drew earlier, and pivoting to continue stitching to the opposite corner. Continue until you’ve filled in this section, as shown in the image above. Repeat for the opposite side of the quilt. You can see how your lines will intersect along the horizontal centerpoint line to create a row of little diamonds (shown in this photo in the solid gray section). The final part is to fill in the top and bottom triangular sections that are left without any quilting. I opted to echo the triangular shape, using quilting lines that were the same distance apart as in the middle section of the quilt. 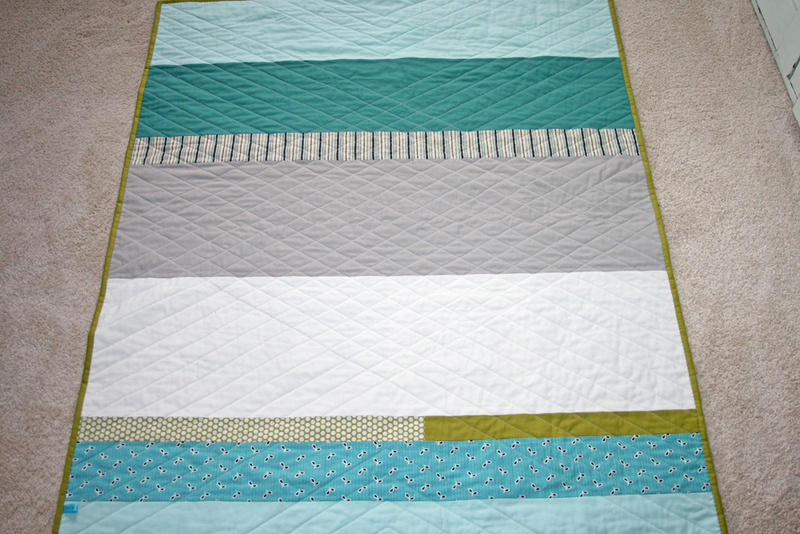 On the manly baby quilt I left an empty space of 3″ and then started these quilting lines. I think this is a fun variation on diagonal quilting, and I hope you do too! If there are any questions, leave them in the comments and I’ll answer there. 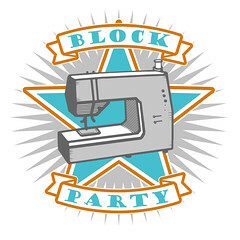 This entry was posted in Posts about Quilts, Tutorials and tagged machine quilting, quilting, quilting tutorial, straight line quilting, tutorial. Bookmark the permalink. That is very cool. I will definitely be trying it. Thanks for the tutorial, hope you’re feeling OK and not too uncomfortable! Thank You! Thank You! Thank You! I only do straight line quilting and am running out of ideas. 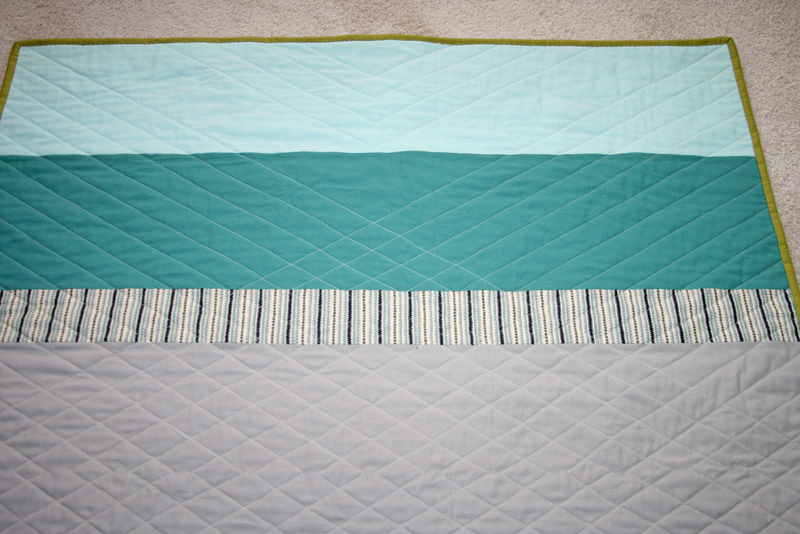 The last couple of baby quilts I have done diagonal lines 2″ apart. And don’t forget to allow for your 1/4″ binding so you don’t lose your points! I learned that the hard way. . . Thanks for this, will try it on my next quilt. It looks very effective. I suppose lots of pins are needed to hold it all together? I use spray adhesive for basting, as described here – http://www.filminthefridge.com/2011/03/03/spray-adhesive-for-quilt-basting-a-quick-how-to/ . if you use pins, you will want to make sure you’re using enough to avoid wrinkles or puckering. Like Dolores, I will definitely be trying this. Thanks so much – I love new ideas – definitely wouldn’t have come up with it myself!! I am just getting a quilt ready to quilt. 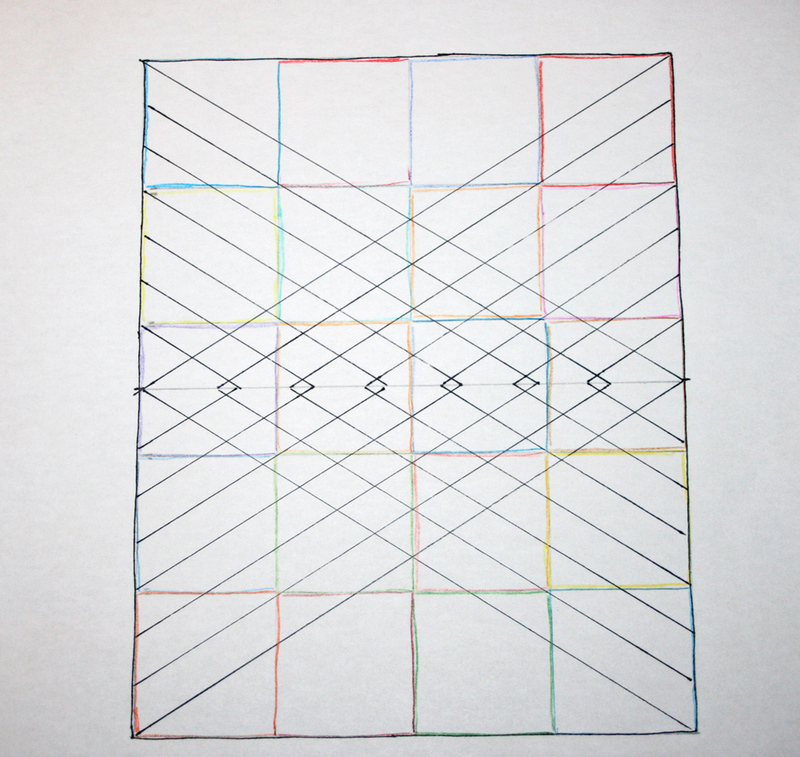 I have been thinking about straight lines and your tutorial is my perfect solution. Thank you so much. Very good tutorial, Ashley. And cool idea! oh i love this! straight line quilting is my favorite. This looks fantastic Ashley. I love the teenie tiny diamonds the quilting forms in the middle of the quilt. Fab. Beautiful quilting pattern! I’m sure you’ve probably mentioned it before, but what type of sewing machine do you use for your quilting? I really like this! Thanks for explaining it (and for including the helpful drawings!). Ashley, I am finding it very hard to get the same results with my straight lined quilting as you, I am curious if you put the feed dogs down and control the with of the stitch. I have found that when I tried with the feed dogs up, I would want to take the whole thing apart. Any other helpful tips that you could share. I have so many projects and i LOVE the look of this type of quilting. I have gotten a little tired of the meandering. I would appreciate it! Hope all is well with you pregnancy! Such a wonderful time. Ooh, that’s fab! Thanks for sharing. Hope final days of pregnancy are as comfortable as they can be. Soon, all those beautiful blankies will be put to work! Can’t wait to hear how it all goes. This bloggy friend in the UK is thinking of you! I just did this and I LOVE how it turned out! Thanks for the great idea and the step by step tutorial! This is a great tutorial. I don’t have a walking foot so doing straight lines like this is hard. You make it seem easy though. Thank you so much. I am new to finishing quilts and this tutorial was so helpful in explaining how to get from point A to point B for a new quilter. It’s so simple once I have the basics. Thank you now I can finish some of my tops. 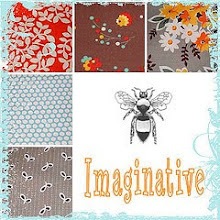 When quilting do you NEED batting/interfacing? I’m making the stacked seating quilt and by the look of the pictures there isn’t any. Thank you for sharing! Maybe I’m less inspired by all-over FMQ designs because I am horrible at FMQ in general, but I always wind up quilting along the patterns lines. Which works and looks nice… But this just might be an equally terrific alternative! Provided I’m able to manage keeping all those lines in order 😉 In any event, I have 5 tops in line for quilting, so I’m definitely going to try this on (at least) one of them! Yay! I found this just in time. I’m about to finish a table runner soon, and I wanted to do something straight line in nature, but I didn’t want a simple grid or just straight lines. I think this method might work well. Google brought me to your blog, and am I glad it did! Thanks for your straight line quilting ideas, and your links to other ideas. I’ve been straight line quilting much more lately (with some success) so your ideas to kick it up a notch have me drooling! Thank you for posting this, even 3 years later I’m finding it to be a huge help. Please send me a private e mail. I would like to ask for permission to link to this or put in a tutorial (with full credit and link to you) for our quilt guild. I am the BOM person for next year (Sept 2014 to May 2015). This would be a great one to provide. Thanks. It is November 26, 2017. I just came across this post. I appreciate this pattern. I think its exactly what I am looking for. Thanks.